Recreational Property! Secluded Paradise! This 100-acre property has it all! Fine crafted all-brick 4-bedroom, 3-bath home with full finished walkout basement and 2-car attached garage. 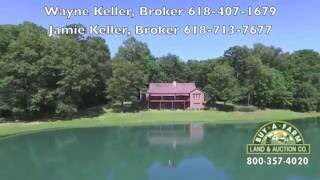 Also….a 1-acre lake, a 5-acre lake, 2 pole barns and a hunting cabin. All on a beautifully wooded site! This home built in 1998 has a large deck on the back with retractable awnings to enjoy the view of the lakes and woods. Geothermal heat/cool, sunroom and den on the main floor and a large office space in the basement. Fish or canoe in the lakes or just sit and enjoy the sites of wildlife, peace and serenity. Over 5 miles of ATV trails through your hunting heaven which is enrolled in the Illinois Forestry Management Program. Sparta school district. Directions: Located just a few miles out of Sparta IL. Showings by appointment only. 4 bedrooms, 3 bathrooms, 3900 sq. ft.